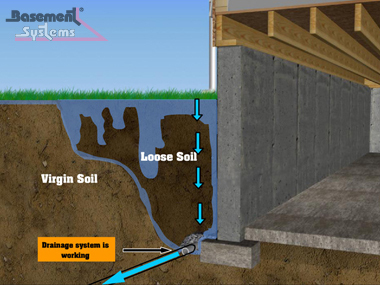 What is a Footing Drain? | Why are Footing Drains Ineffective? Why Do Footing Drains Provide Ineffective Drainage? When you have a footing drain installed, it generally drains to either a storm sewer, sump pump, or to the surface. Storm sewers are notoriously ineffective. The reason for this is that they’re rarely installed deep enough in the ground to make the drain leading to them tilt downwards. Unless they’re installed down into the foundation significantly deeper than the foundation, the water has to run uphill into the storm drain for it to work. Additionally, the amount of water that a storm sewer can store is limited by its size. Once the storm sewer is full, where is the water going to go? Until the day that the drain clogs, a footing drain that discharges to the surface is a solution that can work. However, this can only work in situations where the drain does not have to run uphill, as the water will not naturally flow out of it. Therefore, unless the ground drops off around your home more than 8-9 feet, a downhill incline is not possible. If you have a sump pump installed, you can actively pump the water out of your house. This reduces the need for a natural downhill incline and ensures that the water is being removed. However, the sump pump cannot help you if the footing drain leading to it is clogged and filled with dirt. Footing drains work, but only for a little while and only if they’re installed so they can drain effectively.